Browse Niagara County’s coziest antique shops for some cold-weather treasure hunting this holiday season. There are plenty of wintertime adventures to be found in Niagara Falls USA, but if the thought of braving the frozen Falls or embarking on a high-speed jet boat ride makes you cold, turn to a cozier (and warmer) option. Explore Niagara County’s charming towns with a tour of their antique and vintage shops. Hunt for holiday gifts and decor that no one else will have and gather inspiration for some cold-weather craft projects to bring home. Below, find seven shops with one-of-a-kind treasures. Before embarking on your antiquing adventure, stop into the Village Bake Shoppe on Center Street in Lewiston. Pick up a made-from-scratch muffin or scone in seasonal flavors like apple caramel or maple pumpkin cream cheese, and don’t forget the coffee to help fuel the day of shopping. A few doors down, find the Country Doctor Antiques collection of vendors, with a well-organized and comprehensive selection of beautiful furniture, lighting, framed artwork, glassware and more. Look out for hard-to-find home decor pieces and ask the friendly staff for help if you’re hunting for something specific. About a 15-minute drive east, the Lewiston Antique Mall, with its 50 vendors spanning over 7,000 square feet, is a treasure hunter’s haven. 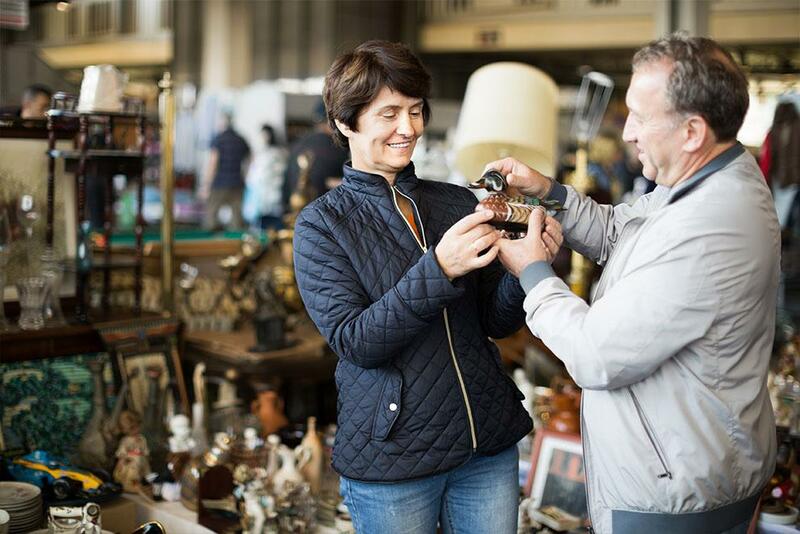 Whether you’re in the market for a specific era of antiques, perennially stylish vintage jewelry, mid-century modern furniture or Star Wars collectibles, you’ll find it here. Plan to take your time browsing through the stalls, and, with some patience and luck, walk away with that perfect statement necklace or pair of striking brass bookends — forever forcing you to field compliments and answer the question: where did you find this? Less than a mile from the Lewiston Antique Mall, the Sanborn Mill Antiques and Collectibles Marketplace has been in business for nearly 20 years. Peruse the planters and outdoor furniture before stepping inside the sprawling space filled with toys, tools, sports memorabilia and glassware in every size, shape and color. A music-lovers mecca, the Mill is also home to a large selection of vinyl records and guitars for beginners and expert musicians alike. Continue on for another five miles to find Shawnee Country Barns Antique Co-Op, with 100 vendors all housed in an iconic red barn that dates back to 1912. Among the meticulously maintained and well-curated collections, there are exquisite teacups and saucers, pottery pieces, kitschy salt and pepper shakers, original artwork, costume and fine jewelry and so much more. Located on property and within walking distance, Patricia's Back Barn offers an eclectic mix of old and new including home decor, vintage clothing and architectural salvage. Drive about 15 minutes south to North Tonawanda. Located just a few blocks from the Niagara River, the Old Chapel Antique & Artisan Market occupies a historic church that dates back to 1894. Open seven days a week, over 70 vendors are spread out over 6,500 square feet, selling both new, locally made crafts and artwork and a comprehensive selection of unique antiques. Don’t miss the basement level — which holds even more treasures. About 25 minutes north, Ann’s Antiques is set in the brick-and-white Wilson Boathouse in the city of Lockport. The shop is packed with rare finds ranging from vintage garden and patio adornments and holiday décor to original art and furniture. This collection of “beautifully curious antiques” also features special holiday sales and what’s more, friendly conversation from Ann herself. Just be sure to check the hours before heading over. Back near your starting point, Ransomville Antique Co-Op also houses a collection of dealers in a former church. The welcoming shop features furniture, glassware, linens, clocks, books, and collectibles, all neatly displayed over three levels. Vintage fashion, including hats and jewelry, are also for sale and would make an especially thoughtful gift for the style-maven in your life. Antiques, vintage, collectibles, gifts, Grape Country Soaps and more!